3 Ninjas Kick Back (Sega Genesis, 1993) Cleaned & tested! 3 Ninjas Kick Back (Sega Genesis, 1993) Cartridge Only! 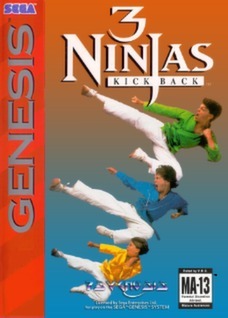 3 Ninjas Kick Back (Sega Genesis, 1993) Used. Includes Box And Book! 3 Ninjas Kick Back (Sega Genesis, 1993) AUTHENTIC! FAST SHIPPING!